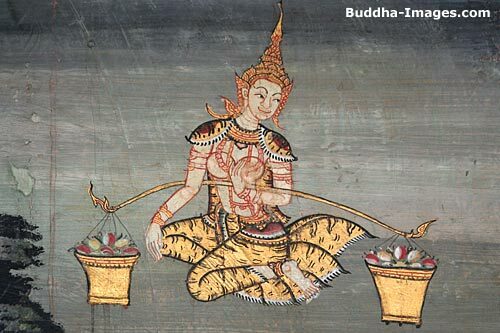 Thai Buddha Images : The 10 Jatakas (Past Lives of the Buddha). Scene from the Vessantara Jataka. This seems to be a very popular Jataka in Thailand. It depicts the life of prince Vessantara who gives away all his possessions, including his children to become servants of an evil spirited character. In the end everything turns out right though. This Jataka displays the virtue of Charity. In the picture the prince and his wife take their children out of the palace to life in the forest. The time had come for Phusati, Sakka's principal consort, to leave Tavatimsa heaven. On descending to earth, she became the mother of the Bodhisatta in his next-to-last birth. In her rebirth in the world of men she was still called Phusati and grew into a most beautiful young girl. At the age of sixteen she was wed to Sanjaya, king of Sivi, and they loved each other dearly. When she became aware that she was carrying a child, she had six alms halls built, from which she distributed silver daily. As the birth of her child grew imminent, she expressed the wish to visit every part of her husband's capital city. The king granted her request and had a lying-in shelter made ready to follow her. On approaching the Vessa, or merchant sector, her labor began. Behind the shelter she gave birth to a son. Having taken his first breath of air from the commercial quarter, the newborn child was named Vessantara, though he possessed none of the avarice of a merchant. For at that time a miracle occurred : the baby spoke to say, "Mother, what gift can I make?" causing the gods in heaven to take notice of this Great Being. When he was eight years old, the boy expressed the desire to be able to give away something of his very own, something that had not been given him by another. He said, "If someone should ask me for my heart, I would give it to him, or my eye, or my flesh." This unusual wish attracted the attention of the gods, so that the earth quaked and thunder rumbled in the clouds over the Himavat. As a youth, Vessantara contented himself with giving away readily and frequently the things he had acquired. At sixteen, his formal studies completed, the kingdom was given over to him and a marriage arranged between the king-to-be and Princess Maddi, daughter of a neighboring king. Maddi, Vessantara's wife, collects food in the forest (see below). The kingdom prospered, and their marriage was happy. A son, Jali, and a daughter, Kanhajina, were born to them. Years before, when Vessantara was a baby, a young white elephant had been brought to the royal stables. The two princely beings grew up together. It was on this white elephant that Vessantara visited his mother's alms halls six times a month to distribute gold. Indeed, many of his subjects attributed the prosperity of the kingdom and the benign rains that watered the fields to the virtue of the white elephant. At this time the nearby kingdom of Kalinga was suffering from a prolonged drought. All the prayers of its people, all the supplications and offerings of its king were to no avail. Many in the kingdom had heard of the great white elephant and of Vessantara's generosity. They suggested that the king send eight Brahmin emissaries to ask Vessantara for the favored creature. The king agreed. When the Brahmins arrived at Sivi, King Vessantara was distributing alms from the elephant. The valuable beast was covered with precious gems and other trappings of great worth. But on hearing their request, the king granted it immediately, pouring water into their hands to indicate the gift, so great was his desire to be charitable. When the gods saw this noble act, the earth shook and the skies were filled with thunder and lightning. The citizens of Vessantara's kingdom were so distressed by the loss of the great animal that had brought them prosperity that they forced King Sanjaya to resume control of the kingdom and banish Vessantara. His parents were heartbroken, but the people's fury was so great that he was granted only one day's grace before exile. On that day Vessantara gave away all his possessions, seven hundred of each kind : elephants, horses, chariots, maidens, slaves, and many others. This was known as the Gift of the Seven Hundreds. People came from far away, each to receive a gift. Vessantara was still distributing them when night fell. Then, with his wife and children, who would not be left behind, he spent his last night taking leave of his parents. The banished family left the city at sunrise in a chariot drawn by four horses. No sooner had the city gates closed behind them than they met four Brahmins. Having arrived too late for the Gift of the Seven Hundreds, the Brahmins now asked for the four horses, which were promptly granted them. The gods dispatched four deities in the form of stags to draw the chariot. However, shortly thereafter a fifth Brahmin appeared, asking for the chariot. Vessantara agreed gladly, the stags disappeared, and the noble prince and his wife continued on their way by foot, the boy in his father's arms, the girl in her mother's. Their journey took them first to Ceta, a city ruled by Vessantara's uncle, where they rested for a day and a night in a hall beside the city gates, for they were unwilling to enter the city, although the king had invited them to rule in his stead. When they left the city the king of Ceta accompanied them to the nearby forest, leaving them with a woodsman who guided them as far as the river. There they rested and were given food. They then set out alone into the foothills of the Himalayas, skirting the shores of the great Mucalinda Lake, and at last they reached the mountains. A narrow path took them through a forest to the foot of Mount Vamka. Sakka, the king of the gods, anticipating their arrival, had ordered his architect Vissakamma to construct two hermitages beside a lotus pond. Vessantara went ahead. On entering one of the buildings alone, he found four sets of ascetic's robes neatly folded and knew that Sakka was observing him. He dressed, took the vows of an ascetic, then went out to greet his wife Maddi. She and the children followed his example. They lived in separate huts by the pond for seven months, eating the roots and jungle fruits which Maddi collected each day. Although Maddi looked after her husband, they never so much as touched each other, for both had sworn chastity. Meanwhile, in Kalinga the drought had broken with the arrival of the white elephant. In a village there, lived a poor Brahmin, Jujaka by name, who had a beautiful young wife. When she went to the well for water, she was frequently reviled and teased by the village women for caring so well for her old and ugly husband. At last she refused to go to the well any longer. She insisted that Jujaka find her some servants in order to spare her ridicule. 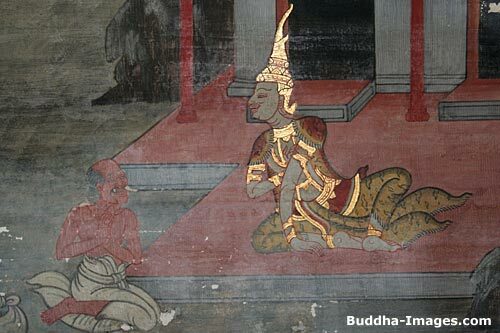 Jujaka (right), on the way to ask Vessantara for his children, asks for direction from forest hermit. Having heard of Vessantara's fabled generosity, she suggested that Jujaka seek him out and ask him for his two children to serve her. As Jujaka was penniless and unable to buy slaves, he set out to find Vessantara. While passing through the forest near Ceta, he was attacked by watchdogs kept there by the king to prevent people from seeking out Vessantara. By saying that he had been sent by King Sanjaya to bring Vessantara back, Jujaka was able to trick the dogs' keeper, a huntsman, into letting him pass. He repeated the same story to a forest hermit, who reluctantly directed him to Vessantara's hermitage. Jujaka waited until Maddi had departed into the forest the next morning before he approached the hermitage. As soon as Vessantara caught sight of the old man he was overjoyed, for he knew that at last he had an opportunity to make a supreme gift. 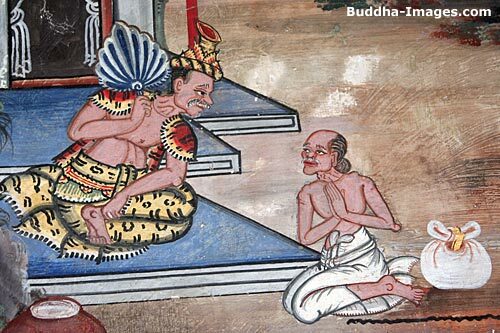 Jujaka, the old man, asks Vessantara to give his children to be his servants. As Jujaka made his unusual request, Vessantara agreed to give away his two beloved children. When the children overheard their exchange of words, they ran away to hide under the broad leaves of the lotus plants in the pond. Soon their father found them and called them back. He presented them to Jujaka by pouring water over his outstretched hands. The gods were disturbed, the earth quaked, and there was a great tumult in the heavens. The Brahmin bound the children's hands with a jungle creeper, whipping them on their way. Tears streamed from Vessantara's eyes, and he went into his hut weeping. When he realized that the cause of his grief was his affection for his children, he set his mind on nonattachment and soon regained the calm of an ascetic. As Jujaka drove the wailing children through the forest, the gods thought what anguish Maddi would suffer if she should see them thus. Three of the deities took the forms of a lion, a tiger, and a leopard that blocked the path of Maddi, thus preventing her return to the hermitage until after night had fallen. Vessantara could not bring himself to tell her what had become of the children. The distraught mother searched for them until dawn. When morning came, she returned to her hut and collapsed in a faint. Vessantara was in great distress. Breaking his ascetic's vows, he raised his wife up, then rubbed her face and bosom with water to revive her. When she was restored, he told her of his gift of the children. Understanding his desire to give away all he possessed, she did not protest. Instead, she rejoiced in his opportunity to make a supreme gift in his effort to achieve omniscience. There remained one last and greatest gift, a devoted wife, and Sakka in his wisdom knew that Vessantara would not withhold it. To keep Vessantara from giving Maddi away to anyone else, Sakka assumed the guise of a Brahmin and approached the hermitage that same morning. Only then did Vessantara realize that he must also give away his dear wife to attain his goal. He gave her willingly to the old Brahmin, pouring water over his hands. Maddi submitted without a word, knowing that this would fulfill her husband's greatest wish : to have perfect knowledge. The heavens shook, the oceans roared, and the gods acknowledged that Vessantara had truly achieved omniscience. Then, having seen that the Great Being was capable of supreme charity, Sakka returned Maddi to him. Meanwhile, Jujaka was lost in the forest. At night while he slept in the branches of a tree, he left the children bound to the trunk. However, deities took the shapes of their parents to nurture and protect them. The gods also guided the path of Jujaka so that although he intended to return to Kalinga, he and the children soon found themselves in Sivi. There the children were recognized and brought before King Sanjaya along with their captor. The king was so overjoyed at finding his grandchildren that he did not punish Jujaka. Instead, he paid the Brahmin a great ransom, with which the old man built himself a splendid mansion. There he lived sumptuously, but unaccustomed to such richness, he overate and died. 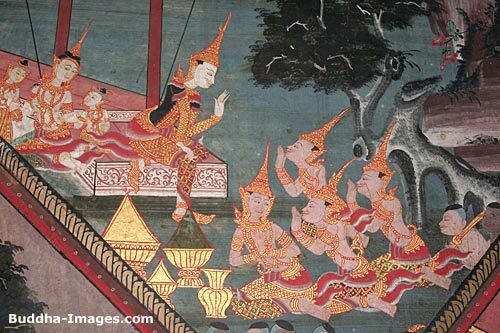 King Sanjaya questioned the children about their parents and was told that they were alive and well. But Jali reproached his grandfather for sending Vessantara away, accusing the king of not loving his son enough. Whereupon King Sanjaya determined to go to Mount Vamka in order to bring the royal couple back to Sivi. To this end he ordered the road to be made smooth and wide, so that chariots could move along it. He ordered his generals thus: "Prepare my armies, elephants, horses, chariots, and banners, to make a royal procession to fetch my son back to Sivi. The road must be strung with garlands and offerings, with plenty of food and wine to assuage the hunger and thirst of the travelers. Let there be music and singing as we proceed." 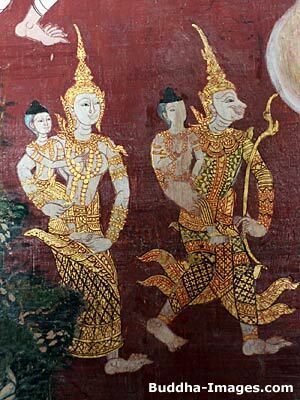 King Sanjaya and his wife Phusati, set out to visit Vessantara and his wife Maddi, and to bring them back to rule the Kingdom. When all was prepared, the great host set off for Mount Vamka, the king and Jali leading the way. They moved across the plains, into the forest, and around Mucalinda Lake, at last reaching the foot of the mountains. All this while, Vessantara and Maddi had lived peacefully at the hermitage. 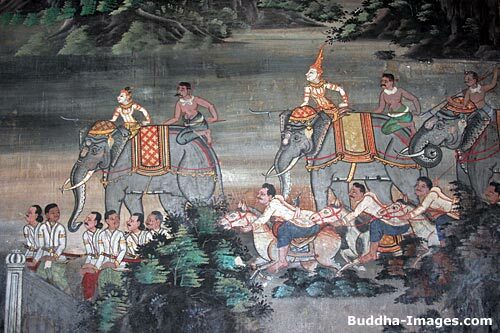 As King Sanjaya's procession approached, Vessantara could hear the noise of marching armies, elephants, and chariots. At first he was alarmed, thinking that they were enemies come to take his life. He and Maddi climbed a nearby hill to survey the scene. Maddi, recognizing the banners as those of Sivi, reassured him, and they returned to the hermitage. 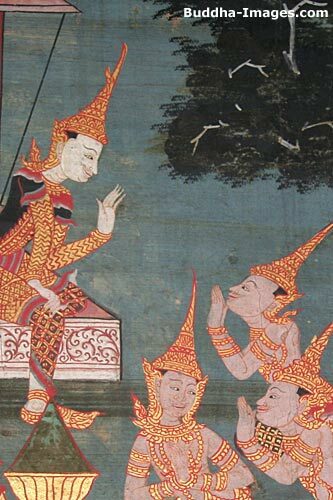 King Sanjaya approached them first and gravely inquired after their welfare. Assured of their well-being, he called his wife, Phusati, and the children to join them. So great was their joy at being reunited that all fell weeping on the ground in a faint. The gods took pity, the earth shook, lightning flashed in the clouds, and from the skies fell a shower of heavenly rain that revived the royal family. King Sanjaya asked Vessantara to return to rule the kingdom, for the people, regretting his departure, wished him to be their king once more. Vessantara, having given all, was willing to resume his kingly role. He put away his hermit's robes. Three times he circled the hut, saying, "Here I have attained omniscience," and prostrated himself before it. Then he was bathed, had his hair trimmed, and was dressed in princely garments, so that he shone with great splendor. Maddi was similarly arrayed in beautiful cloths and gems. Thus they proceeded to the camp of King Sanjaya. After a month of joyful festivities in the forest, they returned to Sivi with great pomp. King Vessantara mounted the throne and by Sakka's will was endowed with treasures sufficient for distribution until the end of his life. After reigning gloriously for many years, the king passed away to Brahma's heaven, to remain a symbol of generosity for all time. 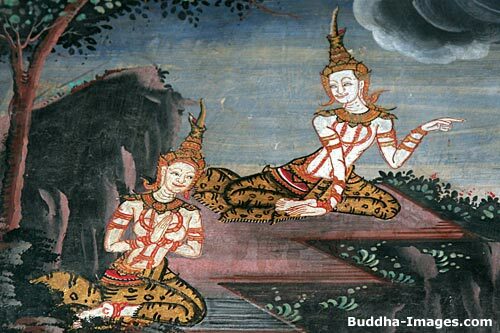 You can read and see another (and longer, with different illustrations) rendition of the Vessantara Jataka, as it is depicted on the Bun Phra Wet Painted Scrolls in Northeastern Thailand.